It is said that Catherine de Medici, queen of France, used snuff to relieve her son Francis II’s migraine headaches, although some claim that she used it on herself. She later decreed that tobacco be fittingly termed Herba Regina—Queen of Herbs. Native to America, tobacco was introduced in Europe by navigators and explorers in the 16th century, and rapidly spread throughout the continent. It became very popular, although in medieval Europe its use was condemned by the Inquisition, alarmed at seeing smoke coming out of men?s mouths. In Cuba, you may find a small number of women who smoke cigars for pleasure, women who only use it for religious rituals and women who grow or make them in traditional tobacco factories. For some time past, Cuban women dared to try a good cigar, not only for its taste and aroma, but because it was considered elegant, and especially because it meant defying conventions. In the early 20th century, it was a rebellious act in the face of social norms and sexist attitudes. Flor Loynaz del Castillo, the rebel sister of Cuban poetess Dulce Mar?a Loynaz, was a faithful exponent of this posture. A woman who at the time smoked a cigar was the height of irreverence. Tobacco has also been used by religious people as a spiritual vehicle in many rituals throughout the history of the island. In pre-Columbian times, the plant was used in a rite called Cohoba, which was exclusive to men, who were in turn called behiques. These men allegedly experienced a supernatural event in which they communicated with the gods or idols they worshiped. Under certain conditions, inhaling the smoke produced from the burning of this herb would herald a safe encounter with their divine beings. In Afro-Cuban religion, mouthfuls of the smoke were used as a purifying act. In the Yoruba religion, it is a special offering to the spirits who were once mortals. Tobacco is the preferred offering made to the saint called Elegu? and everyone smokes a cigar during the ceremony of worship of this saint. Tobacco rollers have always been characterized by their spirit and the authenticity of their craft. They have always been rebellious, enterprising and educated—the latter thanks to the practice of reading, which is a tradition in tobacco factories. The large silent rooms where cigars were manufactured became ideal places for readers to increase the general knowledge and information of the workers and to contribute to the formation of a trade union identity. Curiously, reading has almost exclusively been the task of men, while many women have been—and still are—involved in cigar rolling. 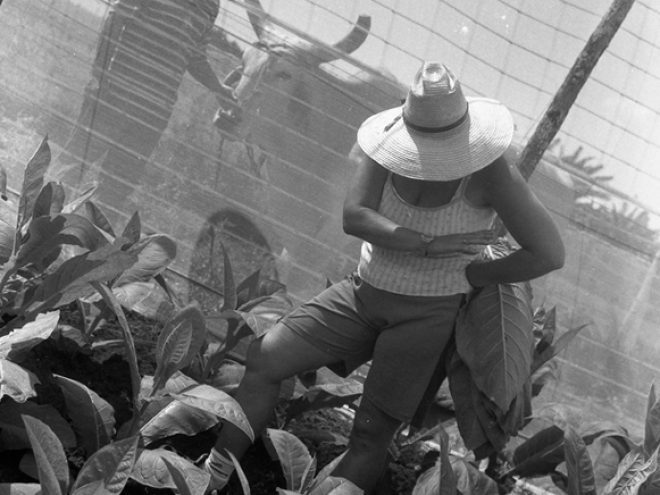 In Cuba, women have always had a significant role in tobacco growing and manufacture. Cigar rolling is an art in which the beauty of the end product goes hand in hand with its quality. Women cigar rollers stamp their own style, however subtle this may be, on the product they create with love and dedication. But not only making a cigar is an art—cultivating, harvesting and curing tobacco are essential processes for great cigars. The leaves are carefully picked one by one as the plant ripens. They are then sewn together and hung on cujes (long wooden poles) in tobacco houses where air-curing is begun. Once cured, the leaves are removed from the poles and covered in burlap and taken to processing centres where they undergo a new process of fermentation and selection. The leaves are then packed and taken to a warehouse where they will rest before they are taken to the factories. Each type of leaf has its own ageing period. Filler, binder and wrapper leaves all go into the making of a Habano. The wrapper leaf is smooth, delicate and flexible and is cultivated in shade-grown tobacco fields. The binder leaf is less delicate than the wrapper and its role is to hold together the filler for the blend. Cuban tobacco is considered the best in the world. This is said to be due to the combination of soil and climate, and the strict quality control and selection during the growing and processing stages. Each tobacco-growing region in Cuba has its own characteristics which define it. The principal regions are Oriente, Remedios, Partido and Vuelta Abajo. The latter, at the far western end of the island in the province of Pinar del R?o, is the premium tobacco growing area of Cuba from where the leaves for Habanos are grown. However, the ever-increasing and severe restrictions on tobacco use the world over have strengthened the notion that smoking should be a purely intimate experience.